The State Flag of Georgia features a canton design with red and blue horizontal stripes and an image of the seal depicting the coat of arms and motto of the state with white stars on a blue background. It serves as a symbol of honor, heritage and regional pride and is displayed at state buildings. There is a strict Order of Precedence for flags. State Flags are displayed in order as they entered the Union. Car Flags are often displayed to represent of an individual's allegiance to their state. Georgia State car flags are used by their owners as mobile emblems of their home. Car flags are usually made from strong materials and are attached to a car via a pole and clip window attachment. What is the design of the Georgia state flag? The white five-pointed star is a symbol of the unity of all things and the essence of the life force. In heraldry a star is a symbol of leadership and excellence. A star symbolizes honor, achievement and hope. Who designed the Georgia State Flag? 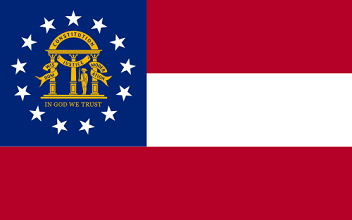 What is the history of the Georgia State Flag? The Georgia flag is kept and used as required by the code specified in the constitution of the state. 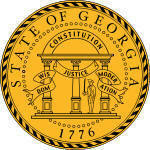 The above pictures tell the story of the history and development of the Georgia State Flag. As you can see the ratios change with the different designs.